The past several years has provided groundbreaking awareness of the role that microbial species on and within our bodies play in maintaining a healthy lifestyle and the onset of disease. Now, a team of investigators led by researchers at the University of Pennsylvania has recently found that the oral microbiome is affected by diabetes, causing a shift to increase its pathogenicity. Findings from the new study—published recently in Cell Host & Microbe in an article entitled “Diabetes Enhances IL-17 Expression and Alters the Oral Microbiome to Increase Its Pathogenicity”—not only show that the oral microbiome of mice with diabetes shifted, but that the change was associated with increased inflammation and bone loss. For many years, much of the scientific community has been under the pretext that there was no connection between the oral microbiome and diabetes, with the European Federation of Periodontology and the American Academy of Periodontology issuing a report four years ago stating specifically that there is no compelling evidence that diabetes is directly linked to changes in the oral microbiome. However, that report didn't sit well for Dr. Graves and his co-authors, prompting them to pursue the idea, using a mouse model that mimics type 2 diabetes. “My argument was that the appropriate studies just hadn't been done, so I decided, we'll do the appropriate study,” Dr. Graves remarked. The researchers began their work by characterizing the oral microbiome of diabetic mice compared to healthy mice. They found that the diabetic mice had a similar oral microbiome to their healthy counterparts when they were sampled before developing high blood sugar levels, or hyperglycemia. Yet, once the diabetic mice were hyperglycemic, their microbiome became distinct from their normal littermates, with a less diverse community of bacteria. “By 16S rRNA sequencing, we showed that diabetes causes a shift in oral bacterial composition and, by transfer to germ-free mice, that the oral microbiota of diabetic mice is more pathogenic,” the authors wrote. 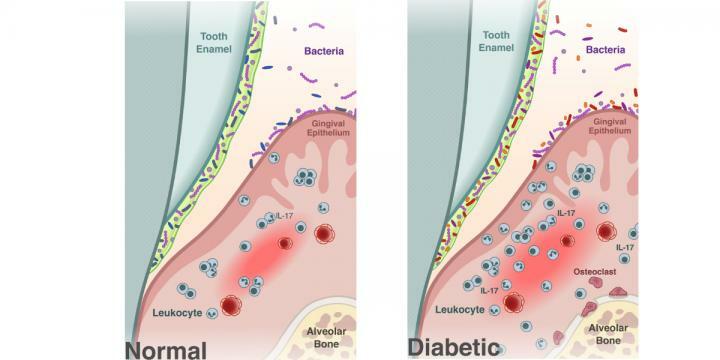 Interestingly, the diabetic mice also had periodontitis, including a loss of bone supporting the teeth, as well as increased levels of interleukin-17 (IL-17), a signaling molecule important in immune response and inflammation. Increased levels of IL-17 in humans are associated with periodontal disease. “The diabetic mice behaved similar to humans that had periodontal bone loss and increased IL-17 caused by a genetic disease,” Dr. Graves added. While the researcher’s findings underscored an association between changes in the oral microbiome and periodontitis, it didn't prove that the microbial changes were responsible for the disease. To find that connection, the researchers transferred microorganisms from the diabetic mice to normal germ-free mice, animals that have been raised without being exposed to any microbes. Remarkably, the recipient mice also developed bone loss. A micro-computed tomography scan revealed they had 42% less bone than mice that had received a microbial transfer from normal mice. Markers of inflammation also went up in the recipients of the diabetic oral microbiome. “We were able to induce the rapid bone loss characteristic of the diabetic group into a normal group of animals simply by transferring the oral microbiome,” explained Dr. Graves. With the microbiome now implicated in causing the periodontitis, the investigators wanted to know the specifics. Suspecting that inflammatory cytokines, specifically IL-17, played a role, the researchers repeated the microbiome transfer experiments, this time injecting the diabetic donors with an anti-IL-17 antibody prior to the transfer. Mice that received microbiomes from the treated diabetic mice had much less severe bone loss compared to mice that received a microbiome transfer from untreated mice—demonstrating unequivocally that diabetes-induced changes in the oral microbiome drive inflammatory changes that enhance bone loss in periodontitis. IL-17 treatment is unlikely to be a reasonable therapeutic strategy in humans due to its key role in immune protection. However, the authors noted that the study results highlight the importance for people with diabetes of controlling blood sugar and practicing good oral hygiene.